Since arriving in Australia at Bundaburg last November we have enjoyed a magic time of entertaining relatives and guests from the UK, NZ &US. We've toured extensively by car and met up with many old and new Aussie friends. Much of this has already been related in our 'Latest News' page, so this update will concentrate largely on our recent journeying. Our experiences in Oz have been so diverse that it is difficult to relate them without falling prey to cyber diarrhoea. So here is a snapshot from the SE corner of this immense brown land. 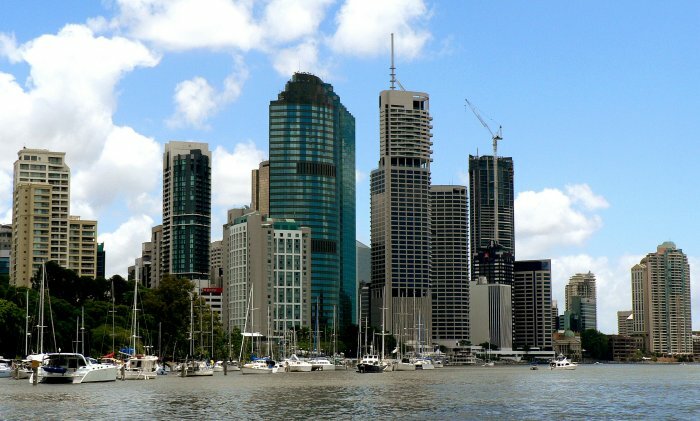 However, in order to show three of the main east coast cities, we will re-run two images of Brisbane, our local smoke, just 35km south of Scarborough where Amoenitas has been based. Above is a picture taken when we took a party up the Brisbane River on Amoenitas to view the New Year's Eve fireworks. It always amazes us how different an impression, usually much better, one gains approaching a city by water rather than by road. 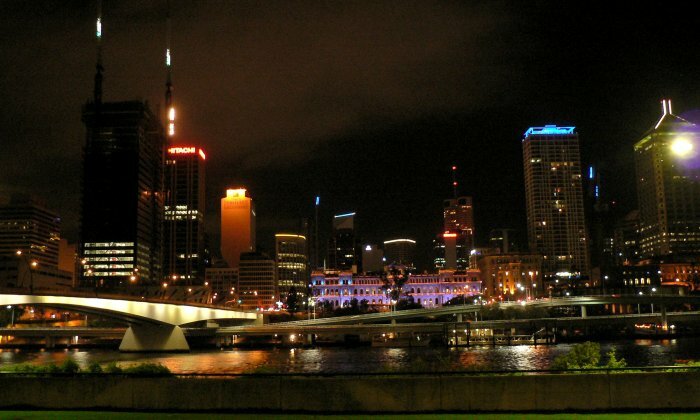 Below is another view taken by night, just a km or so up river, just opposite the South Bank Cultural Complex. Its a lovely city, full of interest but like so many others, getting around by road and even more parking, are the prime determinants on when to go. Just 50km north of Scarborough Marina and well within view most days are these closely spaced peaks below, formed from the cores of a group of volcanoes. They reminded Captain Cook of agricultural glass houses and were so named. Most can be climbed, Dave managed one, alone, on a very hot December day and sensibly called a halt to further exploration. 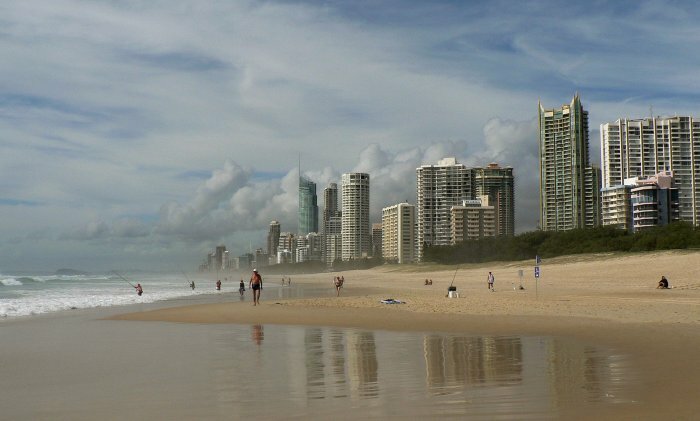 In Queensland summers are hot and generally fairly humid, temperatures reach 30°C by 10am, peaking at 35°C or over. Not surprisingly, beach culture is a major theme all along the east coast. Also, being largely an exposed shallow coastline, there is rarely a shortage of surf which makes for exciting robust bathing. Below is one of the most popular of the State's resort beaches but not one that triggers much enthusiasm from the crew of Amoenitas. A fabulous long beach it may be but the 5km strip of tower block accommodation and their denizens tarnish the appeal. Even in the conditions here, bathing is often suspended when schools of sharks appear close to the beach feeding off small bait fish. Just off Brisbane a girl in her 20's was killed by three sharks in January. Even though we have been swimming with sharks for over four years now, we are very wary in Oz waters, unless there is good visibility. Catching a hammerhead shark on a line whilst fishing from the boat inside Fraser Island wasn't a very encouraging experience! 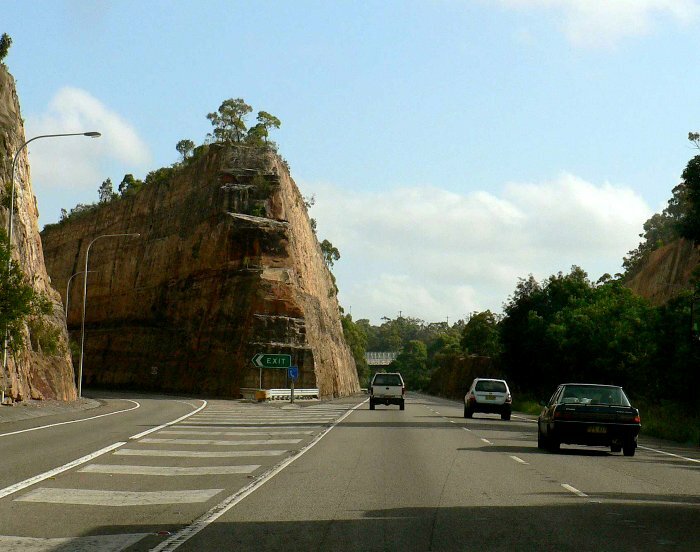 When we first drove to Sydney in January, we were impressed by the way the soft sandstone of the region had been excavated to produce these dramatic cuttings. So, when we returned in March we were prepared with camera at the ready. On our first trip we had stayed with Dot & Ted, friends from way back when Dave and Ted worked on an international project in the US in 1970. It was amazing how the years fell away as we launched into conversation as if we'd only been apart a few days. Our return visit in March was to house & cat sit for them, a super opportunity to see them again and get to know Sydney well. The city proved to be much bigger and busier than we had expected, so the challenges of traveling by car and parking are of the same order as London. However, getting around using a joint train/ferry/bus ticket was a breeze. We spent the better part of three weeks exploring so feel we really got to know the place. Below is the unmistakable view of the skyline of the central business district making a fitting back cloth to the renowned Opera House. 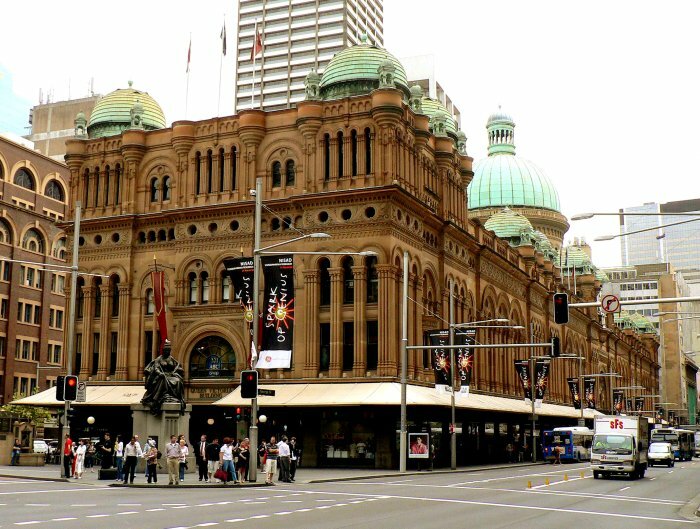 This building has become an outstanding icon for the city, probably singling it out during the decades long rivalry between Sydney and the Victorian capital, Melbourne. Despite the world wide acclaim that Danish architect, Utzon's unique opera house design has attracted, the story of its construction is riven with controversy, argument and of course, massive cost over-run. 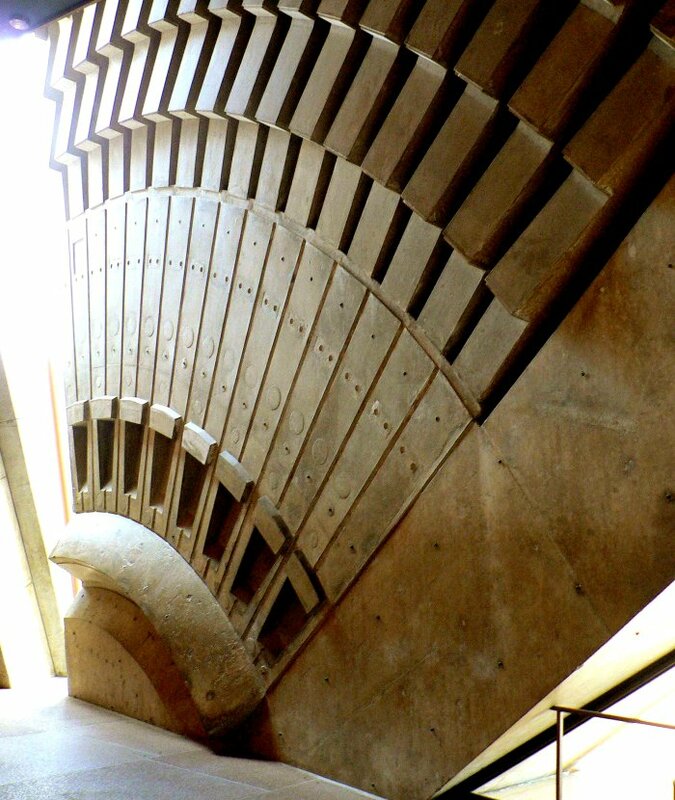 Nothing like it had been built before and Utzon was a perfectionist searching for the best approach to every aspect of the project, in the finest detail. Politics intervened and he departed long before completion, never to return. After thirty years there is now a programme of enhancements being undertaken and pleasingly, Utzon and his son are involved in the designs. The recently completed new colonade was opened by the Queen in March. 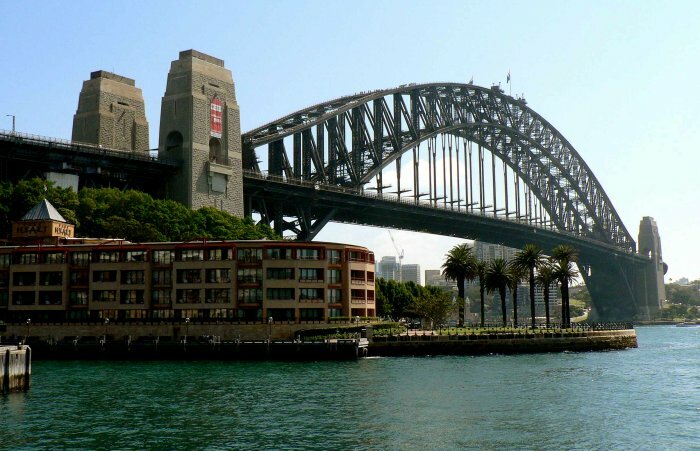 On the other side of Circular Quay from the Opera House is Sydney's other major icon, the Harbour Bridge. (known to locals as the 'Coat Hanger'). The first time we saw it was from below, as we sailed amongst a throng of about 2000 boats on Australia Day (26th Jan). Here we viewed it on a more peaceful day from the Rocks, a historic area from the earliest days of settlement. The structure supports six lanes of vehicle traffic, two rail lines, a cycle track on the far side and a walkway on the near side which gives a superb view of the Opera House. You can even climb over the top for lots of $s but we were discouraged by not being permitted to take a camera along. 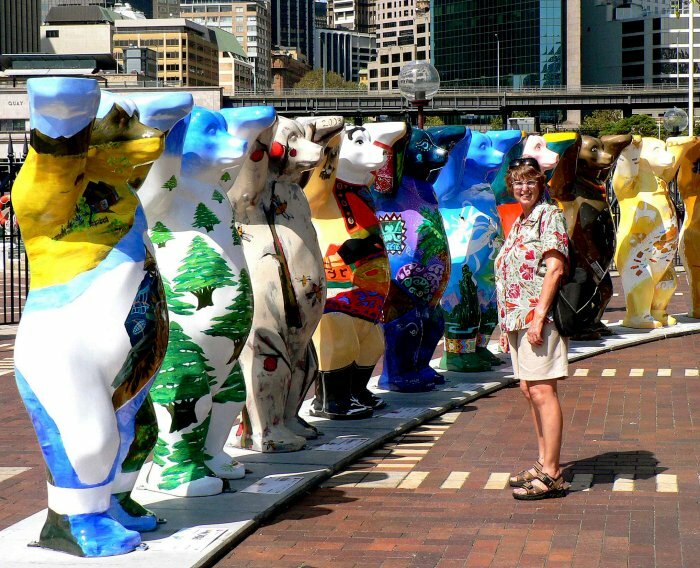 Beside Circular Quay, just a hundred or so metres from the spot where we gazed at the bridge was this delightful UNICEF exhibition of Buddy Bears. Artists from around 148 countries had decorated identical 2m high bears with designs typifying their nation or culture. Sadly the UK bear was one of the few draped with the national flag. 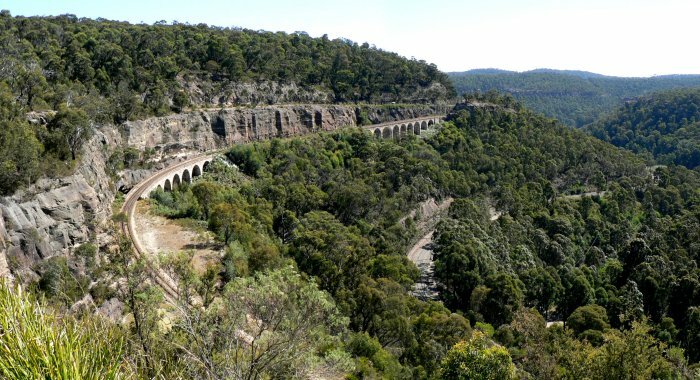 The area encompassing Sydney is mainly of sandstone which though soft and subject to erosion, is easily worked and offers a wide variety of textures, colours and striated patterns. 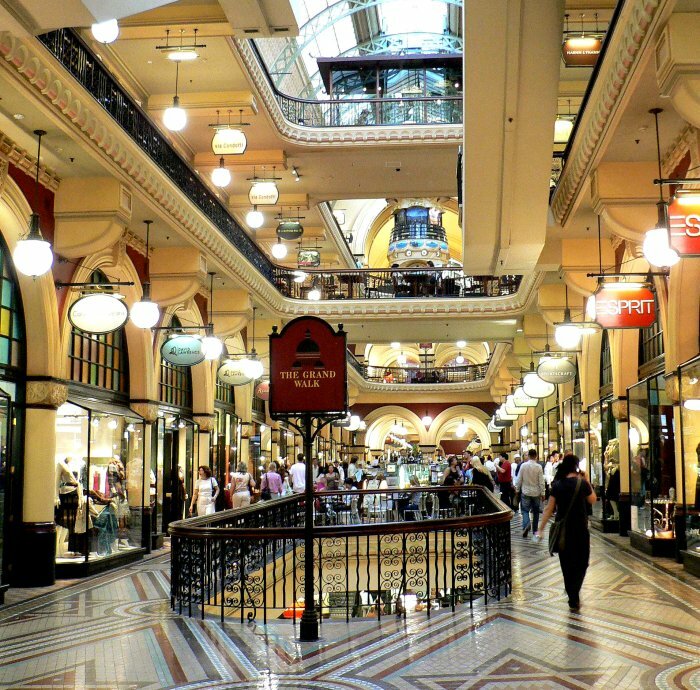 There are so many superb buildings it is difficult to select just one but the Queen Victoria Building (QVB) in George Street is a particular favourite, not just for its exterior but also the four magnificent floors of retail outlets within. These stores on the ground floor are the epitome of high fashion with coffee shops between. In the centre of the picture on the upper floor is one of the two unusual time pieces. This one made by Christopher C. Cook, clockmaker of Sydney depicts scenes from the country's history, illuminated in sequence around its periphery. There is so much to see in the city that occasionally it pays to take a ferry across the harbour to get a different perspective. One of our favourite spots was Watson's Bay, out beside the south side of the harbour entrance, known as the Heads. There you can stroll over to the Gap, where the cliff walks overlook the Tasman Sea or have a special seafood lunch at Doyles with the city's CBD seeming tantilisingly close from your beach side table. 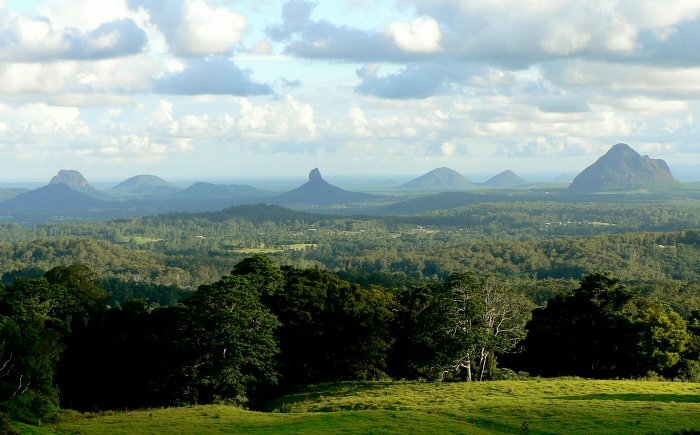 South of the city, beyond Botany Bay, the land beside the sea rises to around 300m which offers magnificent views over the coastal strip and Tasman Sea to the east. 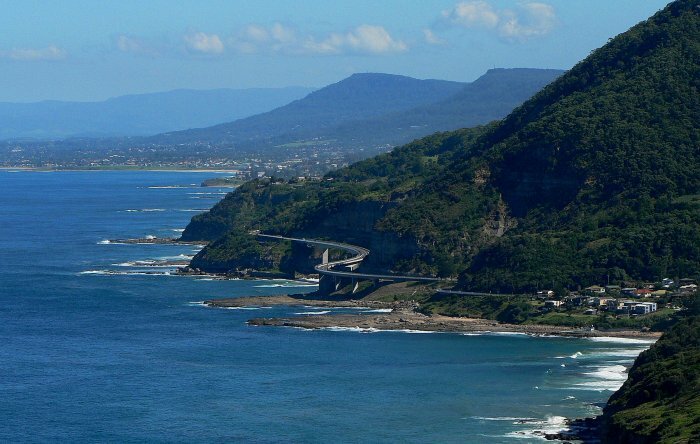 The two prominent headlands in the distance are Sublime Point and Mount Tiera, both accessible by road with stupendous views. 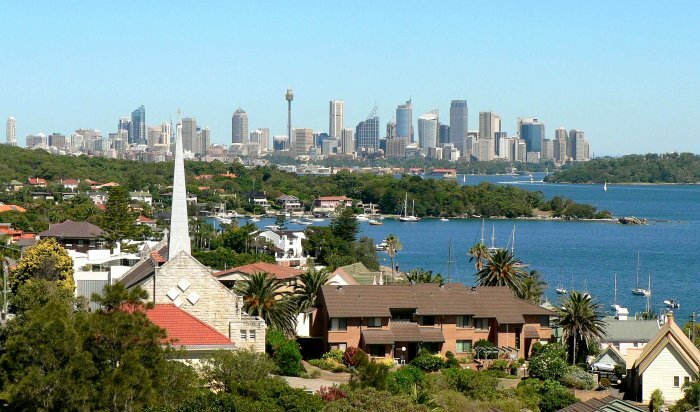 Not far to the west of Sydney is another high plateau of 1000m known as the Blue Mountains. Being so close to the city it is somewhat commercialised but the walks and scenery along some of the escarpment edges cannot be missed. 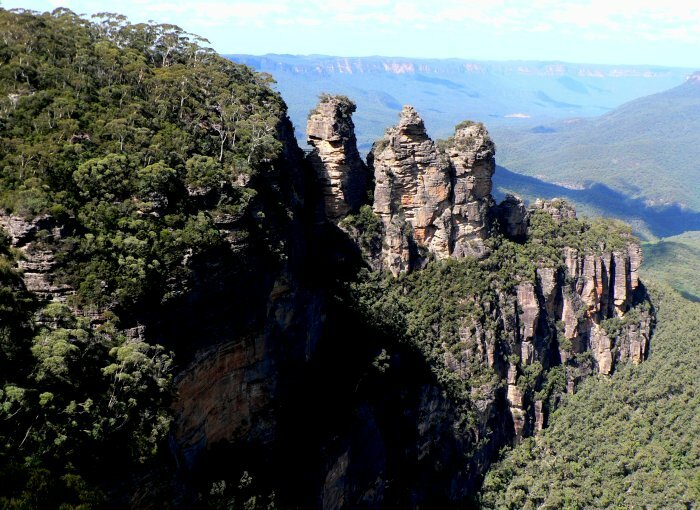 The formation of rock below is called the Three Sisters which overlooks the Jamieson Valley below. Also in the Blue Mountains is a wonderful little railway operated by a voluntary society. It preserves a special feature of the railway which was the primary force in opening up the inner continent to settlement. Built in the 1830's, it overcame the slope of the 300m escarpment by a series of zigzags, each of which ended at shear drops into gulleys. Below the route down from Clarence reverses back over the viaducts and after another change of direction reaches the floor of the Lithgow Valley where the wide swathe marks the route of the modern mainline west. The limitation to traffic volume that this process involved was overcome in 1910 when a series of ten tunnels were constructed to bypass the steep drop. The volunteers do a magnificent job, reclaiming, maintaining and running engines and rolling stock some of which are over 100 years old. Interestingly, though in NSW where the standard UK gauge of 4'8½" is used, this railway found access to Queensland rolling stock easier, so operates on the narrow 36" gauge (yes the Stateshere have differing rail gauges?!?). 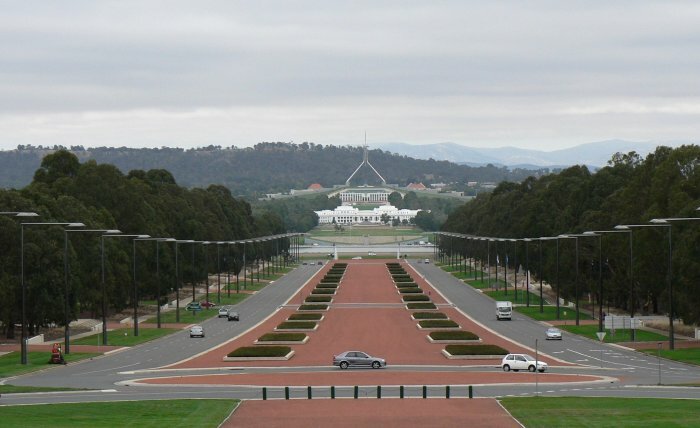 Canberra is a fitting capital with its spacious layout, wide boulevards and impressive architecture. This view down ANZAC Parade from the War Museum looks over the lake to the Old Parliament Building, its new replacement behind with its quadrapod flagpole. Along each side of the avenue are individual memorials to specific campaigns or branches of the services. The War Memorial Museum exhibits are superbly presented, such as a complete Lancaster bomber backed by huge screen with films showing one of the 53 nighttime raids its Aussie crew completed. The Old Parliament Building is open to wander around the debating chambers and all the suites of offices, complete with copious displays of documents, clothes and memorabilia from its around 70 years of active life. Its successor, the New Parliament, is a huge facility, much more fitted to the scale of modern government. Architecturally it interesting in the way it tries not to dominate the surroundings from its hilltop site. This has been successfully achieved by sinking the majority of the structures below ground. Within it has magnificent marble halls and many fine works of art representing the scenes and colours of Australian nature. We managed to gain access on working days to both the Representative's and Senate chambers to observe the proceedings. This included an hour of Question Time with the opportunity to see all the top Federal politicians from PM downwards, participating in an hour of what might be described as pure theatre. Though rather cynical at the way procedure was employed to avoid answering any of the questions, it was fascinating to see all the personalities we have seen on TV and in the press, at close range. 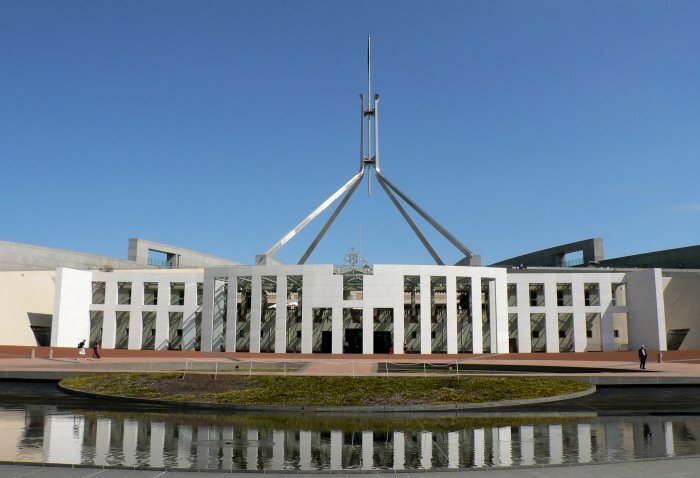 There are fitting homes in Canberra for all branches of the national culture so one can spend days visiting museums, art galleries and the like. The National Gallery of Art had a Constable exhibition of English landscapes and clouds so we were quite at home. The indigenous art and culture is also well represented and of a much richer form than we had expected. 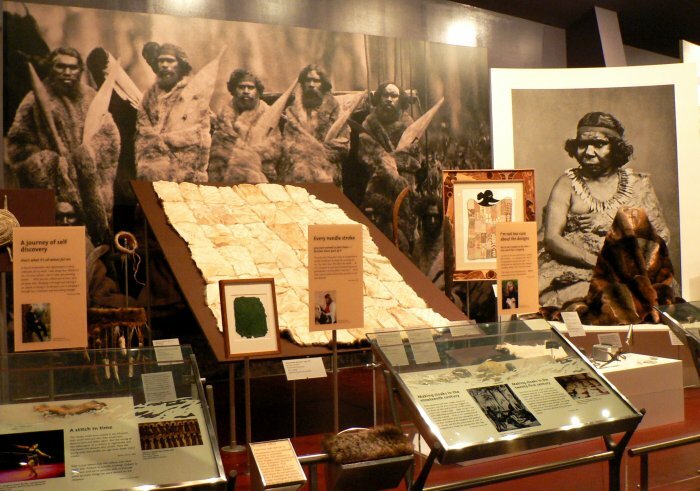 The display below is from the Australia Museum which shows examples of cloaks made from possum skins. Leaving the capital behind we headed south west to the Snowy Mountains which we remember hearing of in the 60's and 70's when the huge river diversion and accompanying hydro-electric scheme was being constructed. 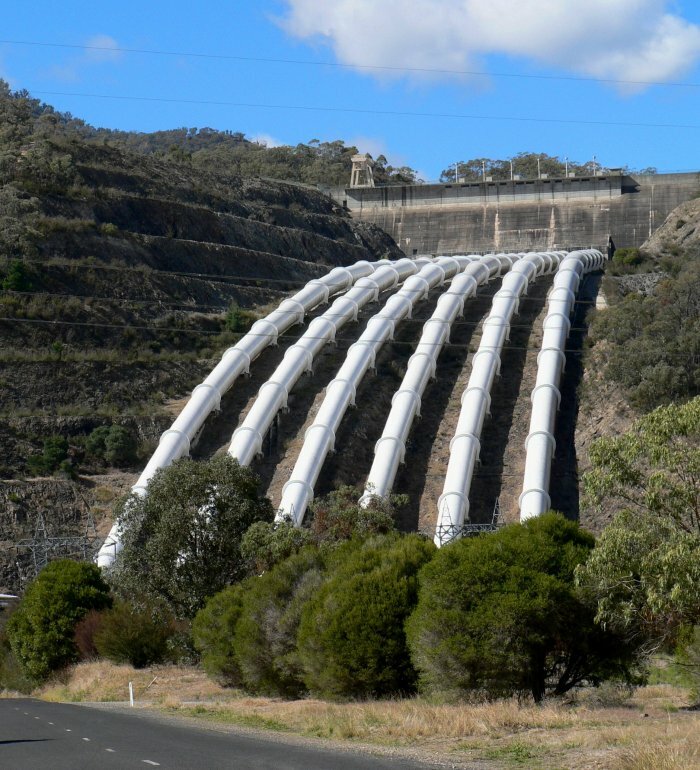 The Darling river was diverted inland to irrigate the central plains, rather than heading out to sea and in an outstanding piece of engineering, hundreds of Km of tunnels and dams were constructed to link numerous water sources into an integrated power generation system. The generating station fed by the six 5m diameter pipes above was open to the public for tours which gave an insight into the scale of the engineering used to shut off and divert huge quantities of water at high pressures. Whist in this area we camped by a creek from which we drew water and washed (not at the same time), doing all our cooking on cast iron BBQs provided at by the Parks Service. An idyllic place to do lots of bush walking and meet Aussie campers around evening campfires with the traditional billy supported by a swing arm over a big fire. The wonderful aspect of being able to camp in the wild bush was the opportunity it afforded to observe the unique wildlife of this amazingly diverse continent. As we have said before, much of Australia is a feral wilderness populated with creatures the like of which you see nowhere else. Unfortunately, a proportion of it can be dangerous so poisonous spiders, snakes and other nasties need to be borne in mind, especially when you are a long way from medical assistance. 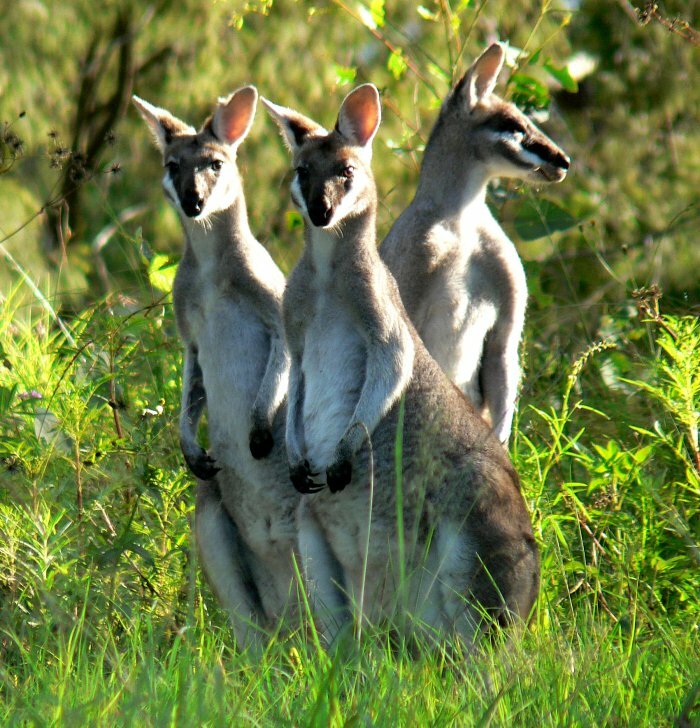 Seeing kangaroos is always a special treat as they appear so inquisitive, often seeking company when they do not feel threatened. The best time to observe them is just after dawn which is when Dave saw this trio of youngsters. The other time they are active is in the late afternoon and evenings which can be a problem if you are on the roads. Many locals say don't drive on rural roads after 4pm unless you really have to. One often sees roadside casualties and impact with a big one can easily write off a small vehicle. 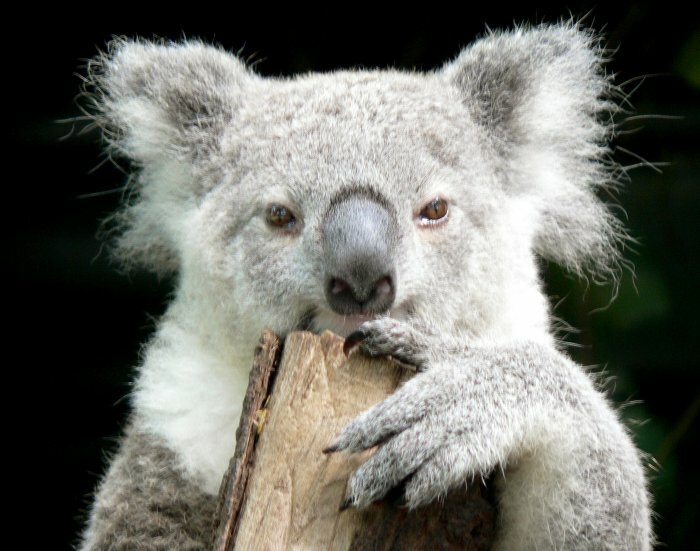 Koalas are another favourite which often appear in the wild but here photographed on a reserve near Brisbane. This little fellow seems to be quietly introspective. Some of the amazing bird life has already appeared in our 'Latest News' updates so here are a couple of our more recent observations. 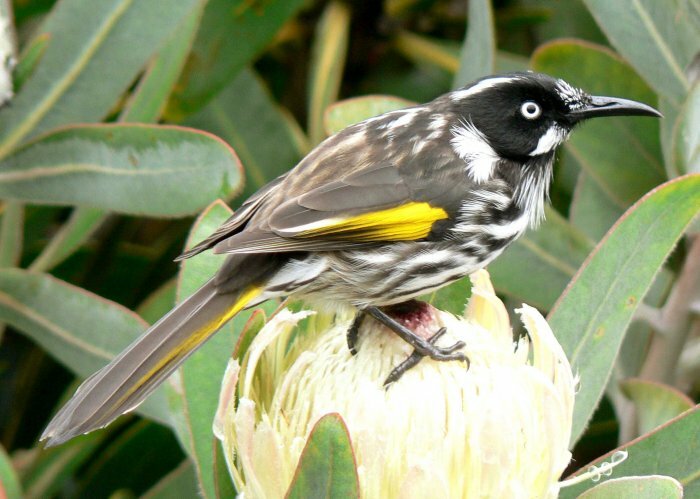 This honeyeater was spotted perched on a protea in the National Botanical Gardens at Mount Tomah in the Blue Mountains. 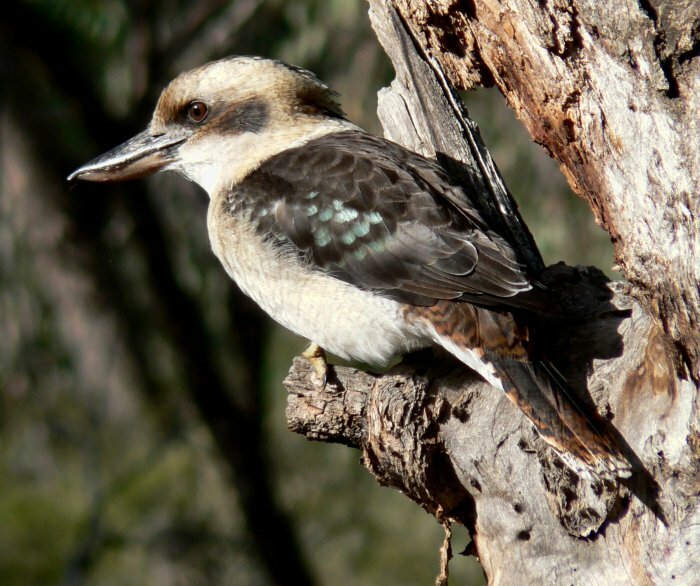 Just by our creek side campsite in the Snowy Mountains was a tree that this kookaburra used to keep an eye on us. They are the largest member of the kingfisher family and as well as being capable of creating an extremely loud laughing call, are reputed to be aggressive feeders. We must admit to never having seen the latter after tens of sightings spanning several hours. 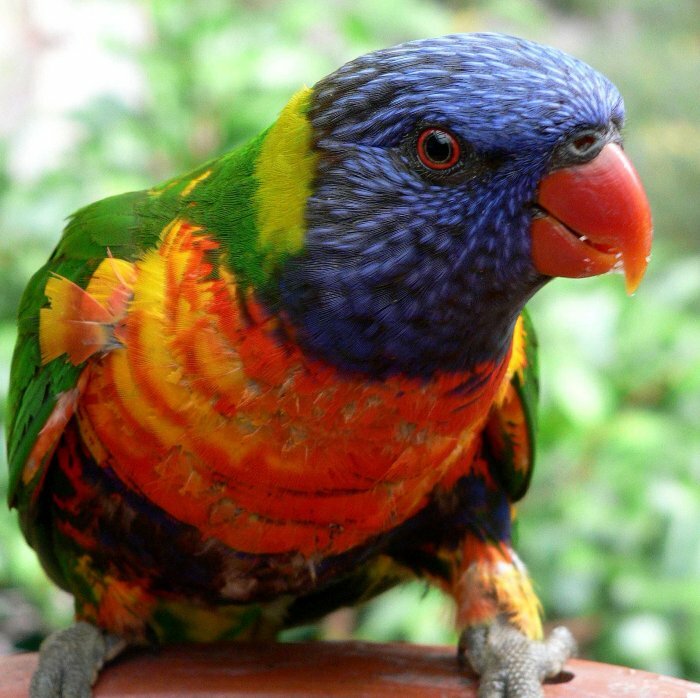 Though fairly small birds (170mm high), these lorikeets are definitely aggressive, seeing off sulphur crested cockatoos over three or four times their size. Normally they visit in pairs bringing a blaze of colour to the deck over the garden at the home of friends in Sydney. We showed a picture before of a goanna, the largest Australian lizard nearly 2m long. which literally, crossed our path in the rain forests of Queensland. This one that we have yet to identify was seen on a shore side walk at Manly, on the outer north of Sydney harbour. 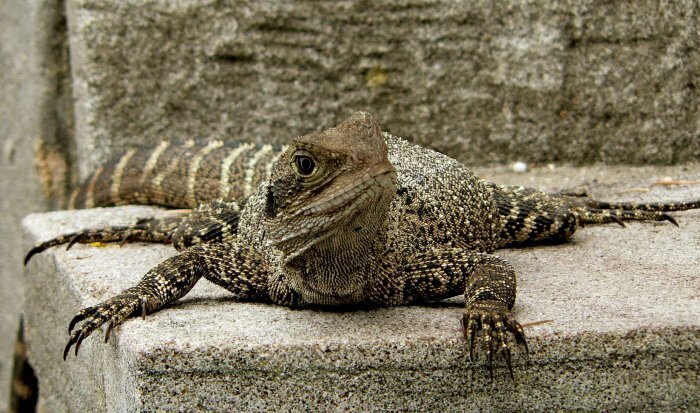 It has a body around 500mm long with a slightly longer tail. Debbie, our Sydney friend's daughter has a passion for spiders which encouraged us to photograph as many species as we could get close enough to (often they are protected by extensive 3 dimensional webs). 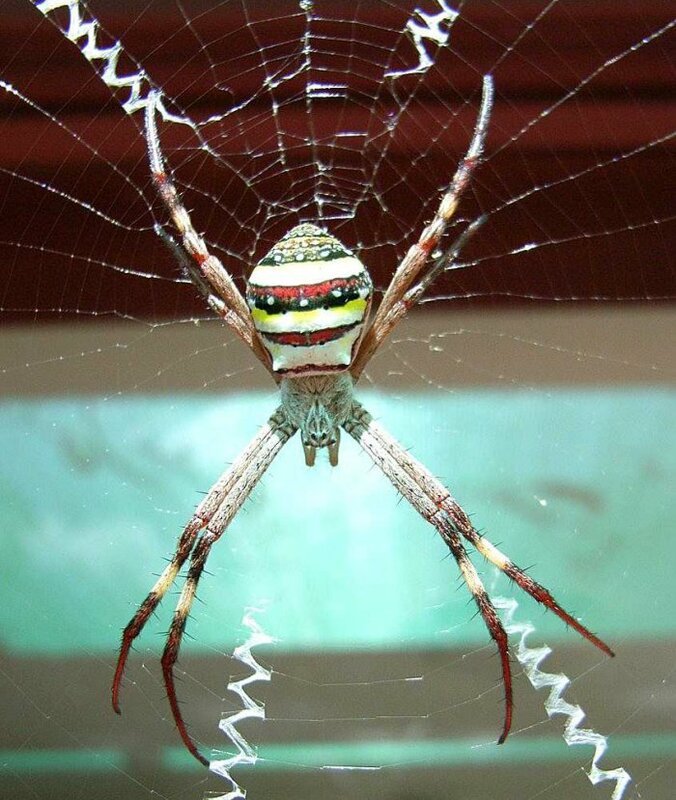 This beautifully marked St Andrew's Cross spider gains its name from the four wide spun zigzag strands radiating outwards from its web resting place. Shortly we will return to Amoenitas in Scarborough to haul out and anti-foul her bottom ready for a departure to New Caledonia in early May. We may spend the whole six month season there, or maybe head up to Vanuatu again for another look at that beautiful archipelago.